No. 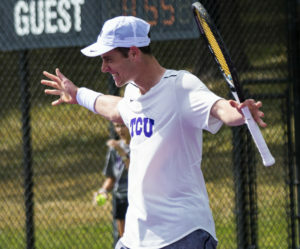 10 TCU men’s tennis recorded a dominant road trip weekend with a 4-3 victory over No. 21 Oklahoma and a 4-1 win over No. 26 Oklahoma State to cap the regular season. TCU’s two wins leave them with Big 12 record of 3-2 and an overall record of 19-5. Oklahoma wouldn’t come without a hefty fight, as the Sooners started the match with a commanding 3-0 lead. TCU was swept in doubles, with Alex Rybakov/Alastair Gray falling 3-6 on court one and Luc Fomba/Sander Jong dropping their doubles match 4-6. The No. 2 doubles team of Reese Stalder/Bertus Kruger, ranked No. 13 nationally, were trailing 5-6 when the match was called. In singles, Stalder continued his cold streak, falling 3-6, 2-6 to open up singles play. He now is on a four-match losing streak. Kruger followed Stadler with another loss. His 4-6, 3-6 loss sets him at a five-match losing streak, including two to unranked opponents. The Frogs finally got on the board with a 6-4, 6-2 Jong win, bringing the overall match score to 3-1. Rybakov moved to 14-2 on the season with another ranked victory, defeating No. 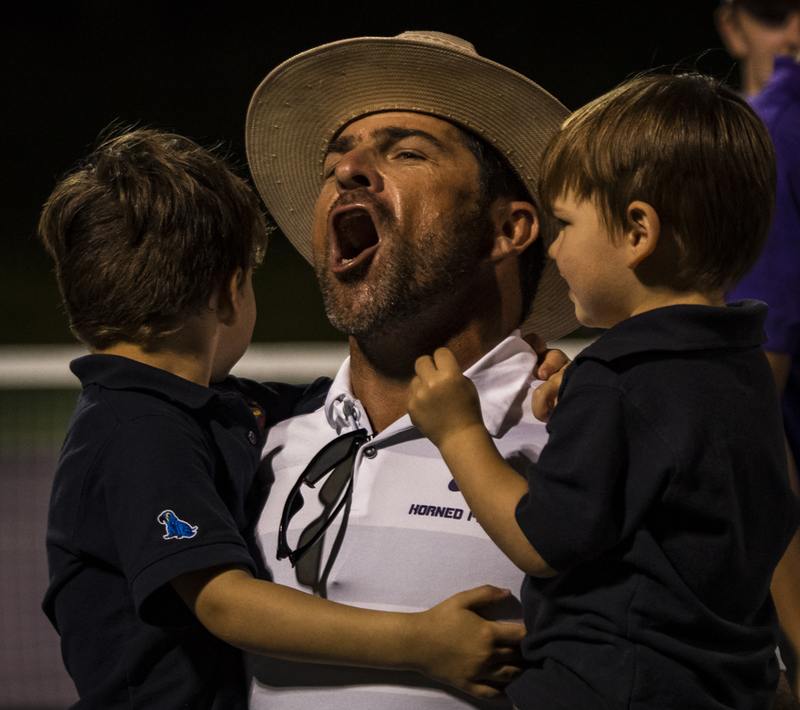 31 Spencer Papa 6-4, 6-2 to bring TCU within one, 3-2. Fomba won a nail biter, 6-4, 6-4, to keep the Frogs alive and continue the day’s trend of only straight-set matches. Similar to last week against Texas A&M and Rybakov, it came down to the final match. Gray put up a 6-3, 6-7 (1-0), 6-4 win to seal the comeback for TCU. Oklahoma continues their downward slide in the Big 12 standings with the loss, now at 1-4 and a four-game losing streak. The Sooners sit at fourth in the conference out of six after the loss. Oklahoma State didn’t put up nearly as strong of a fight, falling 1-4 to the Frogs. The Frogs fell again in doubles after a Rybakov/Gray 6-1 win, Stalder/Kruger 5-7 loss and a Fomba/Jong 6-7 (2-7) loss. Despite the doubles setback, the Frogs came through with a singles sweep. Jong opened singles play with the first match win for the second match in a row, tying TCU at 1-1. He holds an impressive 4-2 singles record since the start of Big 12 play. Rybakov continued to add to the Frogs win column, posting a 6-3, 6-1 win to bring TCU to within one match of victory. Kruger finally snapped his losing streak, winning 3-6, 6-1, 6-4 to win the day for the Horned Frogs. 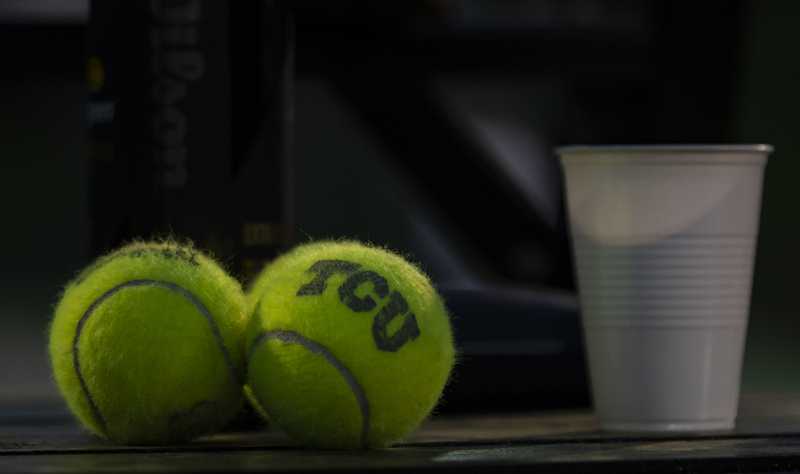 TCU faces Oklahoma State once again, this time at the Jayhawk Tennis Center in Lawrence, Kansas, in the Big 12 Quarterfinals. TCU holds the No. 3 seed in the tournament, while Oklahoma State fell to the No. 6 seed. The match is scheduled for noon on Friday, April 19.